A second helping of evil awaits you in the Pathfinder Adventure Card Game Hell's Vengeance Character Deck 2, featuring three new evil characters from the popular Adventure Path. 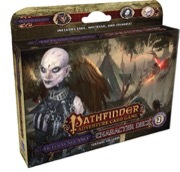 This 109-card accessory for the Pathfinder Adventure Card Game gives your game the cards you need to ruin the day of any paladin on the block. These scurrilous characters can be played in any Pathfinder Adventure Card Game Base Set or in the Pathfinder Society Adventure Card Guild organized play campaign! Announced for November! Image and description are not final and subject to change. Woo! Very exciting! I can't wait to play around with all these evil characters! I can't wait to run Nyctessa through the guild adventures. I'll probably try her out twice even, so I can see what both role cards are like. This product should be showing up here under the Class Decks section, as Preorder, but it is not. I'm guessing that is related to why it doesn't display as well. Adjusted. The product shows up properly in that location now. what classes are in this one?